The idea of a pilot study is to check the research design: test the questions, the length of the survey, the data being collected, and the method by which it is collected. My first lesson was about paper questionnaires. intended to have them available because I wanted to ensure no data bias, by giving access to those without internet at work. I very quickly realised that many – if not all – have internet connection on their devices, and certainly at home. Although it wasn’t cheap, Survey Monkey questionnaires look great, viewed on all devices and operating systems. The builder works very well too. I managed to create the questionnaires just in time before a busy period at work. I was also fortunate with the translation to Arabic which was done and checked by kind colleagues. A few minor edits and I was live at the beginning of October.During the past four weeks, I posted links on my social media accounts and sent emails out to friends and family. I was hoping to achieve 50 or so responses. I am thrilled to have received more than double that. The exercise of analysing these responses should also shed some light on any changes I need to make before I start my empirical work at the end of the year. The literature review and methodology seem to be milestones within the journey of PhD research without any clear reason why they’re there. I say this of course with my old hat of industry and business on my head. I have since learned (and am still learning) the what, how and where these fit in; and more importantly why they need to be there. I am adjusting my literature review to reflect my main research question, and will need to work on writing a clear methodology that sets out the plan on how I intend to answer it. In my quest to learn what my literature review and methodology should look like, I came across many articles, helpful pages on different university websites, and of course some books, videos and online classes. Personally I found the style of Amgad Badewi to be perfectly pitched. It’s simple enough for a non-academic to understand and follow; and is in depth enough to make it worth the time invested to watch. This LINK is a playlist of eight videos which take you from zero knowledge to basic knowledge, in 2.5 hours. Thank you, Amgad, and best of luck with your research. It’s day five and I have managed at least nine hours a day since getting here. I should be able to do more considering I have NOTHING else to do. I’ve even managed to get access (via sconul) to a local university library which makes my daily ‘commute’ a 15-minute walk. Yes. There are no excuses. I am fortunate and extremely thankful. This week I managed to complete the structure of the second part of my theoretical framework (this would have taken me three weeks in Kuwait). I should be able to send my supervisor a draft of the whole thing early next week. He already has the first part (I sent it before I travelled) which he is reviewing and we will discuss soon. Unfortunately, the same weekend I moved to London, he left fora 3-week trip to Canada. It will therefore still be via Skype when we eventually speak again. I hope to see him in person as soon as he returns. Difficult but exciting time. Difficult because I miss my wife and kids. Difficult because I have left everything for her to manage (as well as helping me with my research). Difficult but necessary. Feels great to take control again. Was a little busy this morning, but I got to test out the theory of doing nine hours with zero waste today. I had seven hours to test and I timed it without a minute wasted with any sort of distractions. No achievement to speak of though! 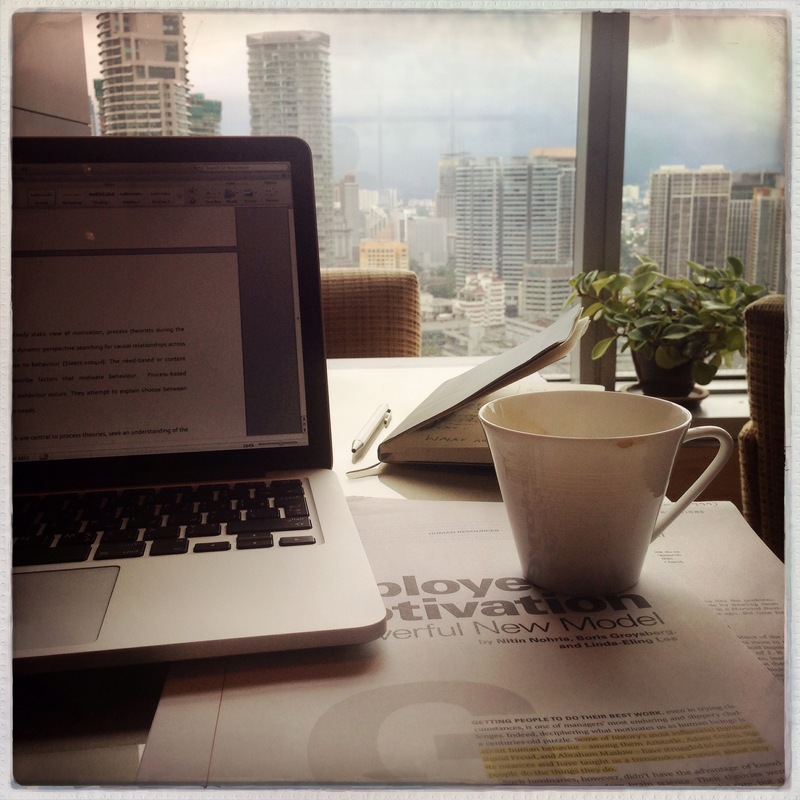 Still learning my way around the process of critical writing … Need to learn and fast. Tomorrow I will have a full nine hours and the timer will stop with any distraction – including my call with my supervisor (on Skype – I’m still in Kuwait). Like it or not, the content of the annual report is mostly a true reflection of the status. Yes… some was out of context, but frankly it has been 30 months and I have only done a year’s work at best. I’m moving to the UK (I am so blessed I have a wife and family who support me – and not just in words) and will be there until I get this situation under control. I will stay until I hand in my confirmation report which has been set to me as a make-or-break target. Not going to be easy nor fun – but I’m remembering now it was never meant to be all fun – some pain is always necessary for anything worth having. I do not need reminding that this is an important milestone and a deadline to stick to. I must complete my literature review on Motivation by the end of October. On a short family holiday last week, I spent more time in the hotel lounge than anywhere else (including sleep) and am a third of the way as I write these words. I need to get to the more quality content after finalising a draft structure and putting in around 10k words (of which half will probably remain) as an introduction to the topic and the relevant theories. How is it September already? My July milestone was missed and I tried to finish my Literature Review for September but that doesn’t look possible. It’s the evening of the 24th and I have just met my supervisor who was not very happy. Nor am I to be honest – frustration is taking over. Frustration because I now know what I need to be doing, I just need to find the time to do it. The review we both agreed was ‘satisfactory with reservation‘ and my comments and his were a fair reflection of the past year. Slow progress but moving in the right direction. I managed to reassure him in less than an hour – after it took me a week of reading nothing but Psychology to reassure myself. The realisation that the answers don’t sit in Organisational Behaviour books, because the source of all the theories are from Psychology, was instrumental. My reading of the past few weeks has been like a language course making sense of what was foreign text. ‘Locus‘ of control, and ‘operant‘ behaviour and god knows what else. It suddenly placed everything for me. I should point out that my knowledge of Psychology until a few weeks ago was an image of Frasier (yes the sitcom) – and yes I know that’s Psychiatry. Looking ahead, I have to complete a large chapter by late October (I’ve written 4000 words of the 20,000 expected), another chapter by January and my Methodology chapter by June. Sounds reasonable – until I remember just how quickly September came. The most basic of time management skills would have taken me to where I need to be without much effort, yet somehow in my attempt to achieve good balance, I tipped everything over. The main victim has been my study time with work, family, social engagements and exercise taking over the rest of my time: on most days, in that order. Since February this year, I have been looking for scraps of time here and there for my study and this simply doesn’t work. A chat with my wife last week spelled out the very obvious. I need to make a change – and now. I have to do things the other way around. Study time has to be set, respected and utilised. Life has to fit around my PhD. This is especially true with me switching to part time and thus requiring a somewhat lighter daily investment . Family stays number one (they let me get on with it more than any family could), work is no longer allowed to invade the rest of my time (not as much as it has been the past few weeks), exercise (not a luxury with my hypertension) will be shorter daily sessions instead of prolonged ones on alternate day. Everything else needs to push its way in. This sounds logical and simple, but I have missed it completely. I feel a lot more positive now – even if I’m missing a major milestone as I type these words. I can see that with this new approach I can quickly catch up, and meet the other milestones set for the next twelve months. It was very much a year of discovery. From knowing nothing about motivation, to knowing a lot more than the average human should. I have read (or looked at) every book on the subject and am slowly working my way through key journal articles. My aims and methodology are not clear but as I read more and more I am becoming familiar with what needs to be tested – and more importantly how to test it. I have also begun to understand the academic world and the process of research at a whole new level. I am asking and enquiring as I read and critique. This is the part that I enjoy most: learning to have an opinion. In short, I have nothing tangible to show for my first year – but I am supposed to hand in a draft of my literature review by the end of April. If I do that, I would be very happy and with it I will be able to stay at my job and switch my PhD to a more realistic part-time programme. The next meeting with my supervisors will be in May. Until then I need to spend all the hours God gives me to finish my literature review. The more I get involved in this project, the more I realise that an hour here and an hour there (even if they add up to half a day) are not the same as a good chunk of time taken together. I took the opportunity of national day holidays to go to London and be alone with my research. I managed to do a lot of reading before meeting my supervisors. My review was a little more positive this time, and my next milestone is to hand in a draft literature review about motivation by the end of April. ‘It’s about 500 words a day’ said my first supervisor. Easier said than done with work and travel. It also looks like I will be switching to part time in April. We will make the final call then if I’m still working. Reading at record speed recently. I am having to slow down now and then when work is especially busy or when I travel. Family and friends time is also suffering but I am going through a lot of material with some good progress on learning my area of research and linking the main theories together into a model that is starting to actually make sense. Although there were words on paper that described – in detail too – what I wanted to do with my research, I was not quite sure what it actually meant. What did I mean by ‘testing a theory’? It took me long enough to grasp the significance of theories and how they draw the pencil lines for management systems that come years (sometimes decades) later. My draft of the Literature Review is forcing me to put down the little I have learned over the past few months into sentences and paragraphs. My supervisors who have left me alone to get on with it thus far explained in our last meeting that my aims would become clearer after I finish the Literature Review. Like many things I am learning in this process, I chose to ignore that and tried many times to adjust my aims to make it into a ‘real doctoral research’. I kept asking them and my wife if there was enough there… Well, today I have finished my Literature Review plan (which is yet to be appropriately filled) and my God it is all making sense. I almost know what I meant when I wrote my proposal over a year ago. It should not be a celebration – but it sure feels like one. I should probably call this post paperless because Papers helps achieve this almost instantly. I spent a significant amount of time reading through what researchers do to ensure a good workflow of reading, collating and referencing articles and books. Had I not seen my wife’s trees of papers blocking doorways and becoming the size of furniture pieces, I would not have even imagined it would be an issue. In the same way many projects fail because logistics are underestimated, I felt this was something of a weak link that needed addressing. My target was, and remains, to have the ability to work on a flight, in an office, at home or in a cafe with everything – yes everything – to do with my PhD on me or accessible online. I am pleased (and cannot believe) that with an iPad and a few apps this is truly possible. It is not the only app I use. I have a page on my iPad dedicated to my PhD apps. The synchronisation of DropBox and Pages is very useful and apps that help with searches in journals are always welcome. The only other thing I carry is a small notebook and a pen. Whilst there are notebook type apps, I’m still more comfortable doing that the normal human way. Update 11 October 2012: Here is another good one. It is hard to elieve that I started in April. The draft of chapter 1 was received well by my supervisors but I have done very little since then. The next agreed step is a draft Literature Review (Chapter Two) by the end of this year. It sounds far away and enogh time – but when I think how quickly August went by without a single letter typed I feel a little anxious. I have also done another PhD no-no and accepted a new job offer. The hours work well (if there is not a lot of travel) and I shold be able to put in enough of an effort. I just need to motivate myself to do so (not intended!). I need to post about the apps that have made working remotely and from different locations easy. They were put to the test during the final days of the chapter-one draft and most passed with flying colours. More details on the next post. It is ironic that I am writing here after a lull of two months and announcing that my PhD research is evolving into the subject of Motivation! Specifically it will be about Kuwait’s public sector and the problems that we have there with people not pulling their weights and demanding salary hikes matched only by bankers in the western world. I have not been working as hard as I should be. However, I have been reading a lot about the subject and am becoming more and more fascinated. My senior supervisor suggested I draft the Introduction chapter – which is usually written last – in order to get my ideas into words. I agree with him and am now drafting my ‘Chapter One’ to share with my supervisors in the next week or so. I need to update this blog more often if I am to look back at it as a diary. I will come back as soon as I have sent off my draft, to write about my paperless work-flow in case anyone else may find it useful.